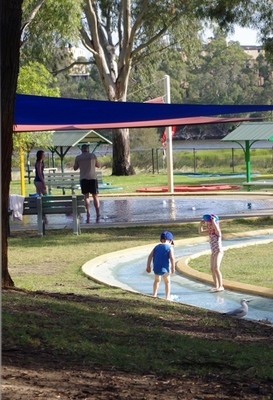 Maylands Waterland is close to heaven for little children – with multiple pools, playgrounds, and picnic tables. 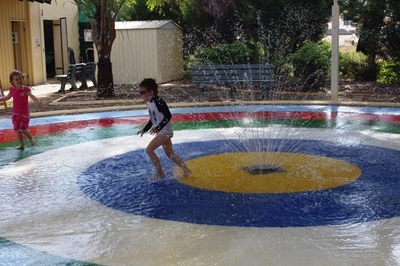 A shallow 'river' runs through the park, enabling children to take a splashy walk to a fountain at its end – or to race sticks in its current. An alternative fountain is reminiscent of a garden sprinkler. 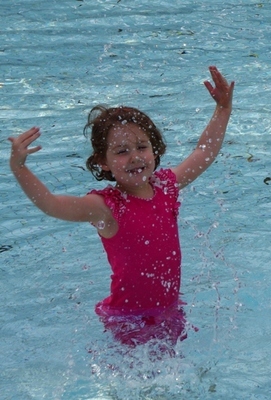 Each of the four swimming pools is a different depth varying from little more than a puddle to 60cm deep so no child need be out of their depth. Three of the pools are under shade cloth. 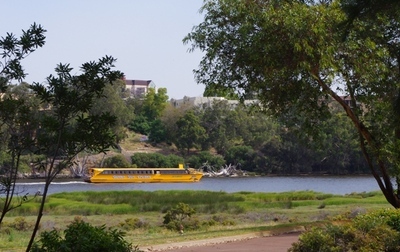 The water park overlooks the Swan River and boasts native trees set amongst the lawns, numerous picnic tables, a snack bar, free barbeques, and even basic mini-golf courses (for which there is an extra charge). The lawns are a bit weedy and strewn with gum nuts so take your shoes with you! 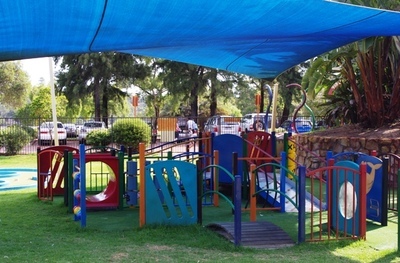 There are two playgrounds. One is particularly suited to babies, with no big heights to fall from. 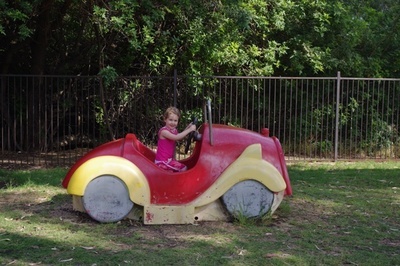 The second boasts a double-sized see-saw, bars to hang off, a slide, rockers, and a large-scale car with room for little drivers to take a passenger. Coming for a ride in my big red car? Waterland has a birthday party package with bouncy castles available to hire on request. 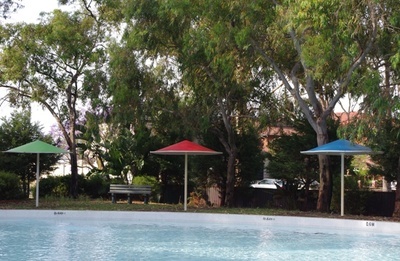 Those who enjoy all things retro will like the cute built-in umbrellas dotted around Maylands Waterland – it would be a fantastic cocktail party venue for adults, if you could convince the City of Bayswater to open the facility at night. 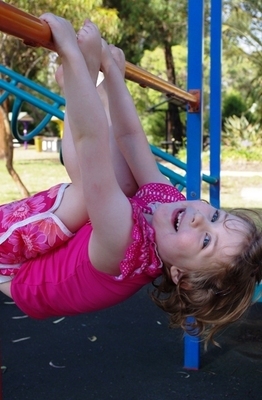 Waterland is very close to historic Tranby House so you could visit both in one outing. Why? Make your kids happy!